In March 2018, the unemployment rate was a low 4.1%, with about 6.6 million Americans unemployed. This is good news for job seekers, as it’s the lowest U.S. unemployment has been since 2000. Different types of jobs are available in different parts of the country, and it can be immensely valuable for workers today to get ahead of tomorrow’s employment trends. It can mean the difference between a secure retirement and a working retirement. In order to take a look at this issue we looked at employment trends to find the fastest-growing job in every state. We looked at the 5-year percent change in people employed in every occupation that the Bureau of Labor Statistics tracks from 2013 – 2017. Check out our data and methodology below to see where we got our data and how we created our final rankings. This is the 2018 version of this study. Check out last year’s version here. Small number increases but large percent increases – With the exception of personal care aides in California, the average fastest-growing occupation for each state employs only about 1,000 people. Since these occupations started with low numbers in 2013, any change represents a fairly large percent change. This does not apply to personal care aides in California. The number of personal care aides in California grew by astounding 546% or 440,000 workers from 2013 to 2017. Solar power – Once again the single fastest-growing occupation is solar photovoltaic installer. These are the people who install solar panels on roofs. Their numbers grew from 4,100 in 2013 to 9,000 in 2017. 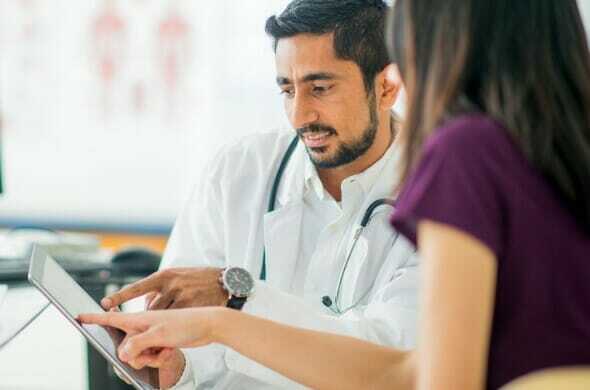 Other fast-growing occupations include personal care aides with 80% growth in numbers from 2013 to 2017 and financial examiners with 71% growth from 2013 to 2017. Wide range in incomes – Incomes for the fastest-growing occupations vary widely. In Mississippi, the fastest-growing occupation is food batchmaker, which comes with an average salary of $26,100. On the other end of the earning spectrum is Maryland. In that state the fastest-growing occupation is post-secondary law teacher and they earn $140,000 on average. The fastest-growing occupations in nine states – Arizona, Mississippi, North Dakota, Alabama, Tennessee, Indiana, Virginia, Washington and Vermont – were production occupations. The most impressive growth and occupation combination was Arizona and metal and plastic machine tool setters. In 2013, the Bureau of Labor Statistics estimates there were only 210 people working in this occupation in Arizona. By 2017, there were 1,560. That’s a percent increase of 642%. In general these occupations tend to not to pay particularly well. In Mississippi, food batchmakers was the fastest-growing occupation, with 5-year percent growth of 368%. The average worker in this profession in the Magnolia State makes only $26,100 per year. Cooling and freezing equipment operators in Virginia earned an average of $29,700 per year. The highest paying occupation in this group is metal and plastic forging machine setters in Tennessee. The average worker in that occupation earns $51,170, a 64% increase from 2013. In fact metal and plastic forging machine setters earn $8,000 more per year, on average, in Tennessee than they do in Alabama, where it was also the fastest-growing occupation. In total the average production occupations which were the fastest-growing occupations in a state saw occupation growth of 313% and income growth of 16.8%. Teaching jobs were the fastest-growing occupations in six states – Idaho, Maryland, New Jersey, Kentucky, Kansas and New Hampshire – plus Washington, D.C. The fastest-growing occupation in this group was post-secondary agricultural sciences teachers in Idaho. In 2013 there were an estimated 50 people working in this occupation in Idaho and by 2017 there were 250. That is an impressive growth of 400%. Unlike production occupations, the fastest-growing teaching occupations pay quite well. For example in Maryland, where postsecondary law teacher is the fastest-growing occupation, the average worker earns over $140,000 per year. In New Jersey, the fastest-growing occupation is postsecondary library sciences teacher. They make just under $73,000 per year, down over $22,000 from 2013. In two states, Kentucky and Kansas, preschool special education teachers was the fastest-growing occupation. In both of those states the number of preschool special education teachers grew by around 250%. Overall in states where teaching occupations were the fastest-growing occupation, they grew by 300% on average. Business and financial operation occupations is the fastest-growing job type in six different states. However, across the six states only three different occupations are represented: credit counselors, which is the fastest-growing occupation in Illinois and New Mexico; financial examiner, which is the fastest-growing occupation in South Carolina, Florida and Wisconsin and credit analyst, which is the fastest-growing occupation in Rhode Island. Despite their relation to finance, occupations in this category are a mixed bag when it comes to pay. Credit counselors in New Mexico and Illinois earn $37,400 and $46,700, on average, respectively. Comparatively across the three states where financial examiner is the fastest-growing occupation, the average worker earns over $75,000 per year. Credit analysts in Rhode Island also do fairly well, they earn over $72,200 on average. However, the long-term pay trends for these occupations are on the decline. All but one of the state-occupation combinations in this category saw average earnings drop from 2013 – 2017. In four states, life, physical and social science occupations are the fastest-growing. In Georgia, social science research assistant is the fastest-growing occupation, in Oregon, medical scientist is the fastest-growing occupation and in Texas and Maine, it’s biochemist and biophysicist. The number of social science research assistants in Georgia grew by over 800% from 2013 to 2017. This is now a relatively popular occupation in the state, with just under 2,100 people employed as social science research assistants. And not only are their numbers growing, pay is growing as well suggesting there is a lot of demand for their services. From 2013 to 2017, average pay for social science research assistants grew by 17%. Biochemists and biophysicists in Texas and Maine should be celebrating. In Texas their number grew by 290% and by 160% in Maine. But the pay be even better than the growing job opportunities. In Maine, the average person in this profession earns just under $74,400 and in Texas the average salary is over $100,000. In fact, in Texas the average pay for biochemists and biophysicists increased by over 40% from 2013 to 2017. Four more states had personal care and service occupations as the fastest-growing occupation. This group is led by one of the rare fast-growing occupations which employs large numbers of people. In California the number of person care aides grew from 80,500 to 520,600. That means in five years the number of personal care aides in California grew by 440,000, or 547%. In Alaska, the fastest-growing occupation was residential advisor while in Iowa, it was concierge and it was recreation worker in Montana. This is one of the lowest-paying occupation groups in our study. Across the four states where a personal care and service occupation was the fastest growing, average earnings was under $30,000 per year. However, one piece of good news on the pay front can be found in California. Not only is the number of personal care aides in California skyrocketing, so is their pay. From 2013 to 2017, average earnings for personal care aides grew by over 19%. STEM jobs tend to be some of the most in demand thanks to their high pay. However STEM jobs are the fastest-growing occupation in only two states – South Dakota and Delaware. The fastest-growing job in South Dakota is systems software developer and in Delaware it is operations research analysts. Neither of these jobs are particularly prevalent in either state. In total there are 650 systems software developers in South Dakota, an increase of 195% from 2013 and 960 operations research analysts in Delaware, an increase of 134% from 2013. However, STEM jobs are still growing fairly rapidly, a good sign for the overall economy. 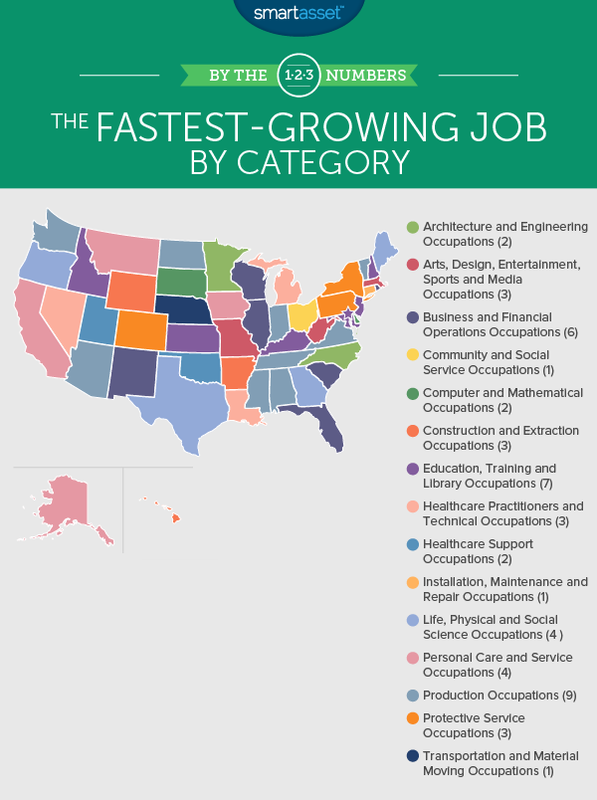 In Nebraska, operations research analyst is the second-fastest-growing occupation and in Illinois, statistician is the second-fastest-growing occupation. As you may have predicted, pay is good in these growing occupations. In 2017, South Dakotan systems software developers earned just under $89,400, an increase of 11% from 2013. In Delaware, operations research analysts earn just over $92,400, an increase of 24% from 2013. In order to find the fastest-growing occupation in each state (plus Washington, D.C.), SmartAsset looked at employment data from 2013 and compared it to 2017. We filtered out any occupation where the standard error for the estimated number of people employed in the occupation was greater than 20. We also filtered out any occupation with “other” in the title. To rank the occupations, we looked at the percent change in people employed in each occupation from 2013 to 2017. All data including earnings data comes from the Bureau of Labor Statistics. Make the most of your 401(k) – Many employers offer a 401(k) match. Taking advantage of this system is basically free money for you. As an example, let’s say your employer matches 100% of your 401(k) contributions up to 3% of your gross salary. By contributing 3% of your gross salary to your 401(k), after applying the employer matching, you would actually save the equivalent of 6% of your gross salary. By simply taking advantage of your employer match, you doubled your savings rate. However, don’t stop contributing to your 401(k) where your employer stops matching. For tax reasons it is a good idea to contribute as much as you can to your 401(k). Remember that $18,500 is the most you’re allowed to contribute in a single year. IRAs are another good option – For workers without employer-backed 401(k) plans, another good option to maximize retirement savings is an individual retirement account (IRA). With a traditional IRA, you contribute pre-tax dollars to your account and then pay taxes when you withdraw from the account after retirement. In theory this should lower your taxable income so you should also have a lower tax bill come tax season. Traditional IRA or Roth IRA? – A Roth IRA is a good option for some people. For those who expect to be in a higher tax bracket in retirement than they are now, a Roth IRA is worth considering. With a Roth IRA, you contribute post-tax dollars to your account but then can withdraw from it tax-free in retirement. Hire a financial advisor to help – A financial advisor can help you figure out how much you money you should be allotting toward retirement to meet your retirement goals. After you’ve come up with a plan, an advisor can also help you stay on track to ensure you spend your golden years the way you want.